Block co-polymers scale interactions up to bring feature sizes down. The block co-polymer most commonly used in directed self-assembly research (DSA), PS-b-PMMA (poly(styrene-block-methyl methacrylate) is an excellent choice because the two component monomers have similar surface energies. The exposed top surface of the film helps to stabilize the segregated domains, making it relatively easy to achieve the lamellar line-and-space patterns that lithographers need. On the other hand, PS-b-PMMA is a poor choice because the similar surface energies of the two monomers mean that the driving force for segregation is relatively weak. This paradox is a key issue in DSA materials development. The Flory-Huggins interaction parameter, Χ, is a measure of the affinity, or lack of it, between the two component monomers. The product ΧN, where N is the degree of polymerization, determines the minimum domain pitch that the material can achieve, the roughness of the transition between domains, and the rate at which the material will reach equilibrium. Block co-polymers force two incompatible monomers to co-exist in the polymer chain. 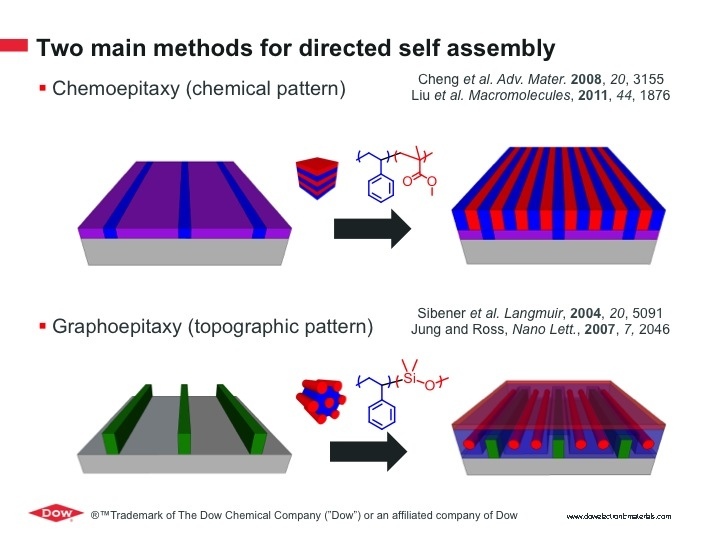 Self-assembly occurs as monomer A seeks to get away from monomer B, and vice-versa. Because the two are physically connected, their ability to segregate is limited by the length of the polymer chain. Thus the molecular weight, which depends on N, determines the domain periodicity and therefore the minimum feature size. To achieve smaller features, researchers need to reduce N.
Unfortunately, reducing the ΧN product reduces the driving force for segregation. Among other implications, weaker segregation means “fuzzier” features, with more line edge roughness and more segregation defects. The ideal material would have smaller chains with a higher interaction parameter. Several potential solutions have been proposed, including solvent treatments and top surface coatings to stabilize the monomer domains. As an alternative, researchers at Dow observed that surface segregation is only a problem for lamellar domain morphology, which is just one of several possible approaches. Instead, Dow senior research scientist Phil Hustad suggested, what about a high-Χ formulation that forms cylinders, rather than lamellae? With cylinders of monomer B lying parallel to the wafer surface, monomer A can fill in the gaps and flow over the tops of the cylinders without disrupting the desired pattern. Remove monomer A, and the cylinders remain, ready for the next step in pattern transfer. 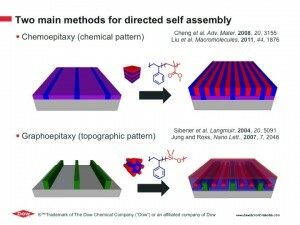 Two main methods for directed self assembly. Image copyright and courtesy of Dow. Dow declined to elaborate on the chemistry of their DSA materials. Other work, at MIT, GlobalFoundries, and elsewhere, has used PS-b-PDMS (polystyrene-block-polydimethylsiloxane) to produced self-assembled cylindrical and spherical features. This approach depends on graphoepitaxy, in which the block co-polymer is confined by physical trenches on the wafer rather than adhering to the chemical stripes typically used with PS-b-PMMA. For this reason, according to Dow senior research scientist Mingqi Li, cylindrical segregation is less sensitive to variations in the surface energy of the underlying substrate, and may have a larger process window. Much of the excitement surrounding directed self-assembly is based on its potential to reduce the pitch of wafer features below what lithography alone can achieve. With PS-b-PMMA, however, the theoretical minimum pitch is about 20 nm, and dimensions in the 30-50nm range are more typically achieved in practice. Further scaling will require the introduction of new materials, which are likely to force new approaches to DSA process integration as well.